How to install laminate flooring transitions - So That's How You Do That! There are many situations that you will need to know how to install laminate flooring transitions. These are very important to use. Their purpose is to cover the edge of the laminate flooring where it meets another floor or where it will end and still provide the expansion gap that is needed. So in this post I will show you several different types of laminate flooring transitions. You will see where they need to be installed, how to plan ahead for them and when to install them. Each flooring manufacturer is different and some offer more than 4 types of transitions. For the most part though, 4 different transitions is the norm. I will show you what each of these are and you should not ever really need anything else. There is really always a way to use these even if you have to modify them to work in a certain situation. I know that some situations can arise where you might not be sure what to do. If you go to my facebook page and post a picture of the situation I am sure I can walk you through it. Please be sure to give my facebook page a “LIKE” while you are there. It would be much appreciated! 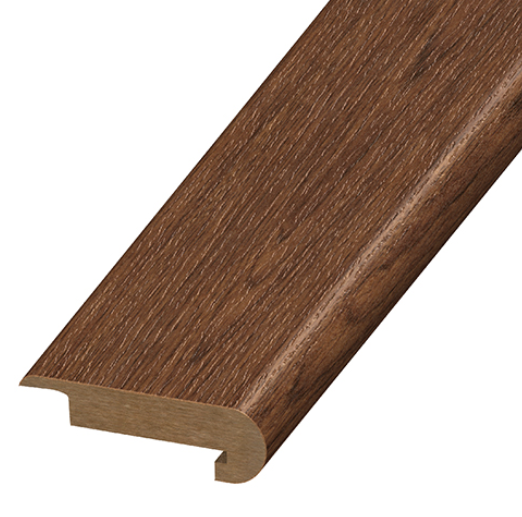 A t-molding is used in situations where there are two hard surfaces that meet. 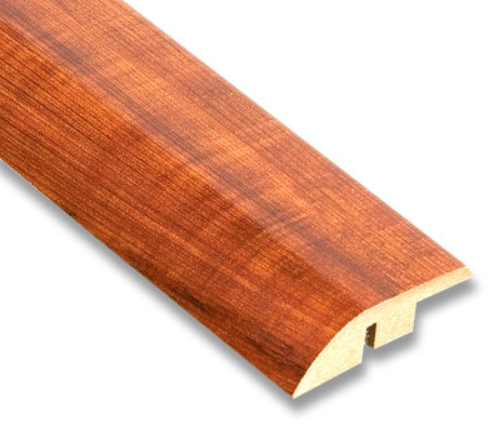 So a t- molding can be used where your laminate meets hardwood, tile vinyl flooring or another laminate flooring. NEVER under any circumstances use a t- molding where laminate meets carpet. The reason is simple, the t- molding will break! It needs the support of a hard surface on both sides. A square nose is used where laminate meets carpet. Once installed the carpet can be tucked to the square nose. The square nose can actually be used in several situations. Some manufacturers will use the square nose also as a reducer(which we will talk about next). They design it with an angled profile but still square it off so carpet can be tucked to it. So it also can be used where the laminate ends to no other flooring. This is a reducer and it is typically used where the laminate ends and there is no other flooring. 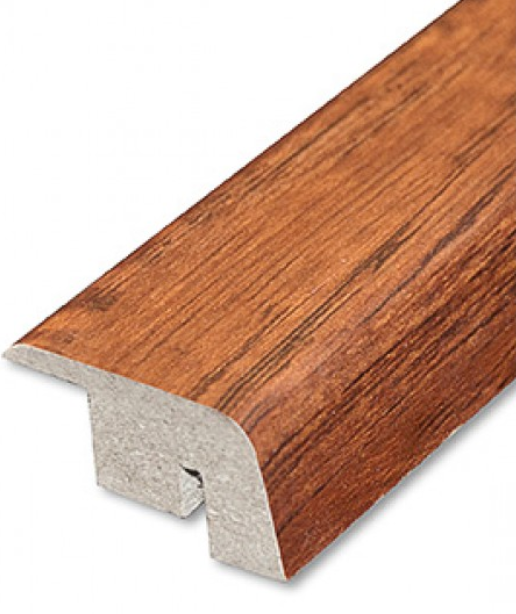 It can also be used in situations where the floor that the laminate is meeting is higher than the laminate. If you have tile, it usually will have a height of an inch from the sub floor. That includes the tile, cement board and the thin set. So what you can do is turn the reducer around so the lip of the reducer covers the tile. Then the reducer will end on top of the laminate. You would still leave an expansion joint between the two floors and use a construction adhesive to glue the reducer to the top of the laminate. The reducer is what I use in many of those situations that need some modification. This is probably the most obvious of them all of where you would use it. The sad thing with the stair nose that they sell with laminate is they never look good. They just have a poor design to them. If you do need to use a stair nose, there is almost always a little modification that needs to be done. You will need to cut the sub floor back to the riser of the step. This will give you the best look. Otherwise the sub floor will show because the lip where the stair nose ends is not long enough to cover the sub floor. If there is carpet on the riser, it will be difficult to make it look good when you try to cover that exposed sub floor. So just trust me and cut it off. One more suggestion, never put laminate on your stairs. Just buy real wood treads and install those. Laminate on stairs is not as ideal as you think. The stair noses are spendy and they are just junk. I could go on and on about this and someday I will do a post on it. Enough of my talking here. I want to show you how to install laminate flooring transitions. Again I want to remind you that if you have any questions about a situation that you are not sure what to do, then go to my facebook page and post a question with a picture or two of that situation. I usually respond within an hour. I hope that this post and the video helped you out. I thank you for letting me help you with your project. If you have any questions on how to install laminate flooring transitions or anything else about your laminate installation please feel free to post a comment below. By the way, if my videos help you please consider watching the advertisements in the videos to help me keep this site going! The way to the Father is through His son Jesus!! 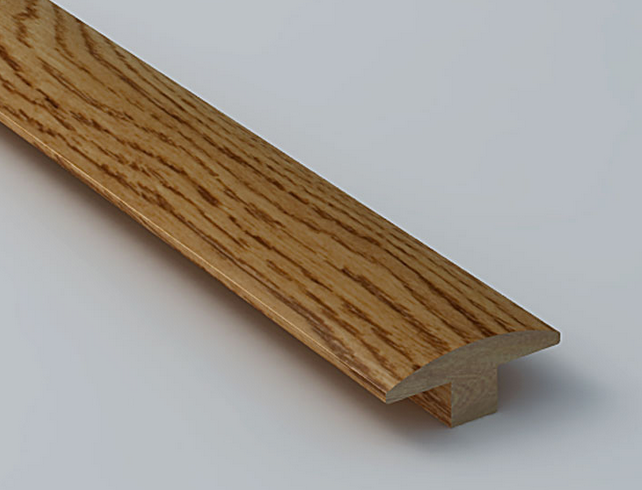 In your video ‘How to install Laminate or vinyl plank around a railing(banister)’, how big was the gap you left for the end cap? It depends on the end cap you have. Measure the leg and add a 1/4 inch. Sorry, I should have mentioned that I don’t actually have one yet, I am just trying to allow for it as I lay the laminate. Is there a general rule-of-thumb I can follow? Thanks for the quick response, I appreciate that! Its usually an inch and an 1/8 of a gap. Aaagh!!! Laminate to carpet…I cannot fit the reducer thing, and the T molding into the track! I am about to lose my mind trying!! I seriously cannot see how these two pieces are going to both fit…I have 3 doorways. The contractor did one…so I know it must work! What am I doing wrong? Uugh…so frustrated! Don’t use the track. Just glue it with construction adhesive. Otherwise just put 2 layers of pad under the track and the secure the track and then put the transition in. Honestly, i rarely use the track. Hi and thanks for the opportunity to ask you questions. I am still in the planning stage for laying a laminate floor in my 1st floor, recently built home. The living/dining room and a bedroom are rug covered but everything else is glued down linoleum (hallway, small kitchen, pantry, full bath). I want to put down laminate all over except for the bathroom. Will the edge of the linoleum where it ends on the slab cause a problem with the floor floating because of the difference in height? I am guessing the linoleum is roughly 1/6 thick and is not curling. Do I need to build up the slab with thin foam a 1/16, tape the edges of linoleum, rip out the linoleum or can I just put the underlayment down as normally done? You can just feather the edge down to the slab with a little floor fill and call it good!! great info!!! laminate was contractor installed in Fla. double wide. water pipe burst beneath deck, must be replaced. How big of an area are u replacing? Everything you need to know is in laminate university and I’m here to help. Hi Joe! We took out tile in the bathroom since it was cracking everywhere (the same cracking is happening in our kitchen). We’re putting in waterproof vinyl plank flooring in the bathroom. Do we need to remove the thinset completely before we can put the new vinyl flooring in? No but if you didn’t then you would have to add a floor fill and smooth it out. Hi Joe, great work thank you, my question is about the chipboard sub floor under the laminated board, how much out of level can the subfloor be to still get a good job, I am expecting to have to get between the board and bearers where neccessary with packing strip to level the subfloor as much as possible. Also have you come across DIY videos of how minor adjustment of post footing supports can be made to adjust floor levels, or is this not really for DIYer’s to attempt? How un level is the floor? If you got to my facebook page and post some pictures of the area I can help you with this. I would like to see what you are dealing with. Follow Us - Help me out and give my page a Like!